Why oh why can’t he, not Summers and Geithner, be calling the shots on Obama’s economic team? They, not he, are the idealists. To all the readers and commenters on this blog, I genuinely thank you for supporting this occasional habit of mine. I’ve been writing posts regularly for a little over a year, and vain as it may sound, the continuously growing number of readers has served as a motivation for continuing to think through and write about some really important issues. I wish you all a wonderful holiday season and hope you’ll be back in the new year. It’s Christmas, and therefore the time when one or another neoclassical economist shows up to point out the impossibility of the gift. The basic argument—this year from Joel Waldfogel, courtesy of the Economist—is that gift-giving represents a “deadweight loss,” that is, the difference between the satisfaction people get when they spend money on themselves and when well-meaning gift-givers spend the same amount of money on gifts. The conclusion: from the perspective of neoclassical theory, gift-giving would be improved by just offering money, and letting people buy their own presents. Thus, in a world of self-interested, utility-maximizing individuals, gift-giving makes no sense. It represents a loss, both on the individual level and the social level. What neoclassical economists miss is the ethical moment of the gift (whether for Christmas or some other occasion), which is the product of the uncertainty surrounding the gift. The uncertainty runs from the decision to make the offering of a gift (what should the gift be, and when should it be given?) to the debt incurred by the recipient (what should the reciprocal gift be, and when should it be given?). The indeterminacy of the gift, and therefore the social relationship connecting the giver and recipient, creates moments in which ethical decisions need to be made. It’s that ethical moment of the gift (and, for the matter, any form of exchange other than capitalist commodity exchange) that escapes the work of Waldfogel and neoclassical economists generally. Significantly, however, according to Derrida, the existential force of this demand for an absolute altruism can never be assuaged, and yet equally clearly it can also never be fulfilled, and this ensures that the condition of the possibility of the gift is inextricably associated with its impossibility. I don’t think I have anything to add, other than that Derrida’s argument is infinitely closer to being right than Waldfogel’s. Shocker, right? I may be going out on a limb, but I don’t think either country is going to be able to make this system work. How could a more equitable distribution of income be instrumental in solving the impact of this crisis? Especially in the UK and the USA the top 20% has close to 50% of the net incomes which is one of the reasons for the bubbles on Wall Street and on the housing market. I am not at all sure about the link between inequality and the bubble. 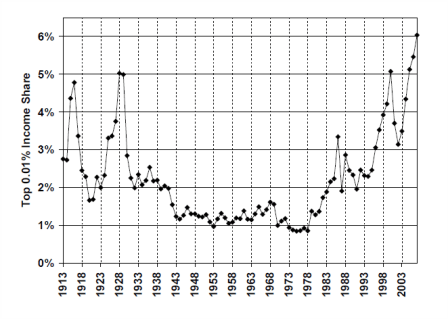 I think that the growth of the financial sector played an important role in increasing inequality in the US and UK. It helped a very small proportion of the population to extract a large amount of rent. But I am not sure about the reverse causal relationship from higher inequality to the bubble. No? So, Wolf can’t imagine how increasing inequality—rising productivity and stagnating wages—led both to higher profits (which could be soaked up by the financial sector through securitization) and increased borrowing (on the part of wage-and-salary-earners), thus generating a financial bubble. Not such a difficult argument to imagine and make, although seemingly beyond Wolf’s worldview. And, of course, once you imagine a link between inequality and capitalist crises, then you have to think about solving the inequality problem in order to solve the crises. And that’s a place Wolf clearly doesn’t want to go. But how, exactly, do you reconcile this assertion with the fact that we have a negative savings rate, and that consumption is at a near-record share of national income? I mean, by all means let’s worry about inequality. But I don’t get how this particular reason for worrying about inequality can be reconciled with the facts. Isn’t the collapse of our mortgage/credit-based consumption justification for worry about this particular aspect of inequality? Krugman confuses me here, because people like Dean Baker, whom he often cites approvingly, have been making the inequality-bubble argument. And for someone like Krugman, who likes to go off his economic intuition, it is fairly easy to connect the dots for an unequal society temporarily staving off underconsumption with unholy credit mechanisms before finally going down in flames. As for Wolf, there seems to be little hope for him on this particular topic if he can’t read between these lines. Here are a few quick hits on some longer posts and articles you should read. …the conduct of science is driven by the values that the institutions of science inculcate and enforce; the incentives created by the scientific institutions shape and motivate the behavior of scientists; and the product of science is the result of the constrained activities of scientists shaped and motivated in these particular ways. We can and must do better than that. But to do so, non-orthodox economists have to find tools that can express their vision of the economy analytically, either as mathematical or computer models. If we don’t, then whatever might be said by “Critical Realists” about the inappropriateness of mathematical analysis in economics, or how one can’t model open systems mathematically, the critics will be sidelined in a not too distant future by those who do use such models–and who care a good deal less about realism than the critics do. Yet again, the critics may win the philosophical battle, only to lose the methodological war. We should not have tax breaks for the retirement savings that go to people in the very top bracket — it doesn’t make any sense. If the government is going to lay out money to help people accumulate their retirement funds, they should do it for lower-income and middle-income groups. The other principle they had is that retirement contributions should be pooled and professionally managed. . . . It minimizes costs and also smoothes out financial risks. Newshour (ht: jw) had a segment that featured a debate between Robert Skidlesky (Keynes’ biographer and most recently author of Keynes: Return of the Master) and Russell Roberts, who is a professor of economics at George Mason and blogs at Cafe Hayek. The debate was pretty much what you’d expect, given the intellectual influence of both, but it had an entertaining twist. Roberts is producing a hip-hop video about this very topic. Here’s the video (and here’s a link to the interview transcript). I’ve also put just the excerpted rap lyrics below the video for your enjoyment. My general theories made quite an impression. I transformed the econ profession. You know me, modesty. Still, I’m taking a bow. So, say it loud and say it proud. We’re all Keynesians now.